Mysuru: The long-pending issue of Vijayashreepura Layout is back to negotiation table where a series of parleys have to be held all over again to find a solution to this vexed issue. An indication on this was given by Chief Minister Siddharamaiah when SOM questioned him about the layout and the plight of residents who have been desperately trying to save their houses from demolition. 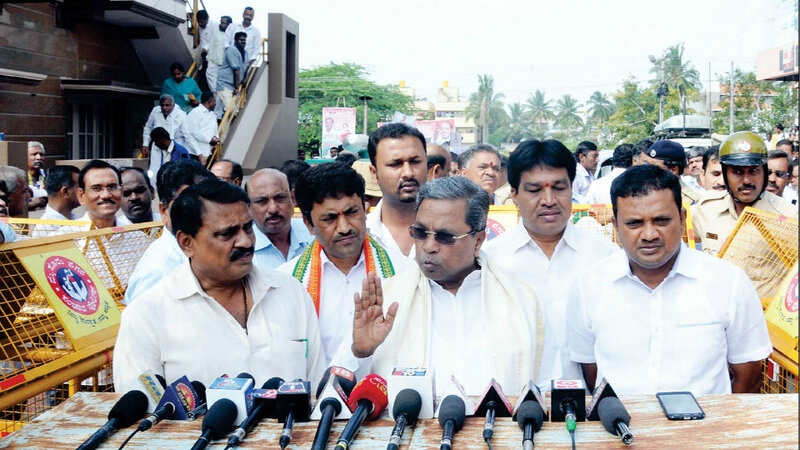 Yesterday, the CM had stated in Mysuru that the Vijayashreepura issue will be brought before the Belagavi Assembly Session and a suitable decision will be taken where the land will be de-notified in favour of existing house owners. When reporters questioned him about the vast areas of land under Kurubarahalli Survey No.4 and Alanahalli Survey No. 41 that have been classified as ‘B Kharab,’ the CM said this particular issue will not be tabled at the Session. Today again when he was asked about Kurubarahalli and Vijayashreepura, he did not react on Kurubarahalli issue. Changing his yesterday’s statement on Vijayashreepura, he said there was no need to table Vijayashreepura issue at the Session. “This is an issue of land ownership and has become complicated as original owners (Chaduranga Kantharaj Urs and family) have moved the SC and many houses have been built on the land. We will call the royals to the negotiation table and settle the matter,” he said. For the record, the State Cabinet on Oct. 11 decided to implement the Supreme Court order on the land that extends up to 94.28 acres and comes under Survey No. 1, Vijayashreepura. It will pay compensation of Rs. 55 crore to the original land owners. The Cabinet also decided in principle to regularise the land and pay compensation to the family of late Sirdar K.B. Ramachandra Raje Urs. The compensation will be paid to Chaduranga Kantharaj Urs (son of Sirdar K.B. Ramachandra Raje Urs) and his family as per the 2001 guidance value and as per Section 180 of Karnataka Land Acquisition Act 1961. It may be recalled here that on June 1, 2017, at a meeting with CM Siddharamaiah, MUDA Chairman D. Dhruvakumar and other officers including the then Commissioner Dr. M. Mahesh, Chaduranga Kantharaj Urs had agreed to withdraw his petition in the interests of Vijayashreepura residents. Now despite Cabinet decision on Oct. 11 of providing relief to the residents and despite CM meeting Chaduranga Kantharaj Urs on June 1, the issue has not made any headway and is back to discussion stage.